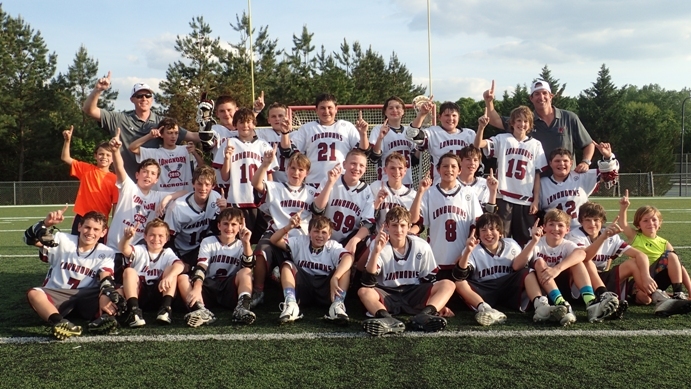 Longhorn Youth Lacrosse offers boys programs for both beginners and experienced players whose primary residence is districted for Lambert High School. We currently participate in the Newtown Rec Lacrosse League, which allows the boys to play against teams, both inside and outside of our county. Both spring and fall seasons include clinic style learning sessions for boys in all age groups. This enables consistent learning of the essential lacrosse skills necessary to continue to develop a passion and enjoyment of the game. Lambert boys in grades six through eight that would normally play in the House league also have the opportunity to play more competitive, travel lacrosse during the spring season through the Junior Longhorn program (see below). The Junior Longhorn teams play against other high school affiliated "feeder" teams throughout North Atlanta. Lambert zoned boys also have the opportunity to play summer travel lacrosse through the Atlanta Rage program. The Atlanta Rage summer teams are reserved for the more committed and generally more skilled players. The Atlanta Rage teams play in multiple tournaments in the Southeast and Mid-Atlantic states during the summer and fall seasons. A more detailed summary of the House, Junior Longhorn and Summer travel programs is provided below. Little Longhorns (Pre K - 1st) Clinics: Our goal with this group of boys is to introduce them to the game in a non-threatening yet competitive environment where they can learn the basics and have fun in the process. Although every season is different, we usually break these boys up into small groups and have them participate in station drills, with each station focusing on a different skill set (throwing, catching, shooting, etc). The clinics last one hour and we typically hold eight clinics on Saturdays or Sundays in the spring and eight clinics on the weekends during the fall session. Clinics locations will depend on available field space each season, but we plan to hold them at either Sharon Springs Park, Joint Venture Park or Lambert High School. 2nd - 5th Graders: This group of boys is divided into leagues, 2nd/3rd grade and 4th/5th grade. Typically, we have 4-6 LYLA teams in each league along with teams from the South, Central and North Forsyth leagues. To create the LYLA teams, we use a ranking system that assigns a rating based on each boy’s experience and skill level. The rating system comes from the coaches, who rank the boys at the pre-season evaluations. We then assign boys in a manner that ensures, to the extent feasible, that we’ll have parity amongst the teams. During the spring season most of the games are played on Saturday and/or Sunday at Sharon Springs Park or Joint Venture Park. In addition to the games, the boys practice two nights per week, one in a clinic format with all the LYLA players in their league one night with their team. 6th - 7th Graders: We usually have between 2-4 LYLA teams in this division along with teams from the South, Central and North Forsyth leagues. We seek to create equal teams by rating the players during pre-season evaluations as described above. Most games are usually played on the weekends at Sharon Springs Park, Joint Venture Park or Lambert High School. In addition to the games, the boys practice two nights per week with their team. U15 Longhorns: The U15 Longhorns is made up of 8th and 9th grade Lambert bound boys and sometimes boys from other Forsyth County schools. This team plays in a U15 league sponsored by an organization called Newtown Recreation (www.newtownrec.com). Practices are held during the week at Sharon Springs or Joint Venture Park and games are held primarily on the weekends. Home games are at Sharon Springs and away games are held at other parks in Forsyth or North Fulton County. High School Club Lacrosse: Longhorn Youth Lacrosse also sponsors a high school club lacrosse team for 10th - 12th grade players that are not playing for Lambert High School's Junior Varsity or Varsity team. The high school club team plays in the North Georgia Lacrosse League (www.ngllclub.org). Practices are held twice a week at Sharon Springs or Joint Venture Park. The team will play 10 to 14 regular season games with a season ending tournament to crown the league champion. Games will be played primarily on Sunday afternoons with an occasional game during the week. Many teams will play double headers throughout the season. Current teams are located in the Atlanta Metro Area including Cobb, Cherokee, Fulton, Gwinnett, Henry Counties and Oconee Counties. Our Junior Longhorn program offers 7th and 8th grade boys a more competitive lacrosse environment. This program is aimed at those boys who have more advanced skills and are committed to the game. The tryouts for the Junior Longhorn teams are run by the Lambert High School varsity lacrosse coaches and are typically held in early November. Based upon those tryouts, the Lambert High School Varsity lacrosse coaching staff selects the teams. Boys selected to participate on the Junior Longhorn teams must pay an additional registration fee to cover the additional costs associated with the Junior Longhorn program. If a boy wants to participate in the Junior Longhorn Program, and he also plays another spring sport, we expect that he will make lacrosse his priority sport in the spring. While the program aims to provide all players with equal playing time, attendance and effort at practice and games can affect playing time. In addition, our Junior Longhorn coaches reserve the right to play who they view as their strongest players during critical stages of the game. Games in this league are generally played on the weekend; however, there may be an occasional game during the week. The Junior Longhorn teams practice three times per week at Sharon Springs Park. Home games are usually played at the Lambert High School stadium. During the fall, Longhorn Youth Lacrosse offers a Rec league program where players focus on skills development, as well as participate in game play. Teams will practice once per week with a game on either Saturday afternoon or Sunday. The focus in practices and games is skills development and continued focus on player development and improvement in preparation for the upcoming spring season. We encourage players who are playing other sports in the fall to join us for practice and games, or games only if practice conflicts with the fall sports schedule. Under the leadership and guidance of Rich Wehman, Lambert High School's Director of Lacrosse, the Atlanta Rage is a travel lacrosse program that is designed to be a developmental program for Lambert bound players that have demonstrated a certain commitment, skill level and ability to play competitive travel lacrosse. The Atlanta Rage teams are coached by Lambert Lacrosse Alumni, many of whom are now playing in college, and members of Lambert High School's current coaching staff. For more information about the Atlanta Rage Lacrosse program, please visit www.atlantarage.com.